Japanese sedan, and slightly narrower than the American version. Honda's global operation platform has produced three different Accords for the world's four key geographical manufacturing and marketing zones, North America, Asia, Japan, and Europe. 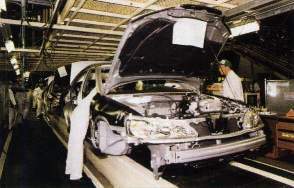 Chronologically, September 1997 saw the midsize U.S. Accord and the smaller Japanese version arrive. Asia, except Japan, opted for the larger U.S. model. And now, the European Accord is making its bow to the old world. The new platform and powertrain strategy has also launched the Acura TL near-luxury sedan and the second generation Odyssey minivan. The European Accord is 4595 mm (15.08 ft) long on a 2670-mm (8.76-ft) wheelbase, 1750 mm (5.74 ft) wide, and 1430 mm (4.69 ft) tall, is shorter than the U.S. and Japanese sedans, narrower than the American model, but wider than the Japanese car. It is specifically, though somehow conservatively, styled to suit European taste. DOHC, 16-valve, VTEC 2.2-L inline four of the Type R.
Hisao Suzuki, president of Honda R&D Europe, concedes that the three pronged product development strategy may not be the most cost efficient as far as design, development, and manufacturing are concerned. Suzuki insists, however, that it is the way to ensure the brand's survival and prosperity in this fiercely competitive world. It is true that the previous-generation Accord, which was a global model, was hugely successful in North America, but its market performance in Japan and Europe was not up to the expectations of the ambitious company. Honda thoroughly researched the strengths and weaknesses of the incumbent European Accord, which had actually skipped a generation in its evolution. For the new car, Honda aimed higher, its competitors no longer popular Ford Mondeos and Opel Vectras, but Europe's hottest major league players in the D segment, smaller BMWs, Audi A4s, and Volkswagen Passats. The European Accord is a front-wheel-drive car, available in two body types: four- and five-door sedans, to the U.S. ranges' sedan and coupe and the Japanese series' sedan and wagon, reflecting each zone's customer preferences. The all-steel, welded, unitary body possesses oustanding stiffness, said Kenzo Suzuki, EVP and Accord project leader at Honda R&D Europe, doubled in bending and torsion characteristics as compared with the preceding model. Honda went so far as to commission a British independent test institute to perform a series of Euro NCAP standard crash tests in addition to its own in Japan, to ensure, according to Suzuki, four-star performance. 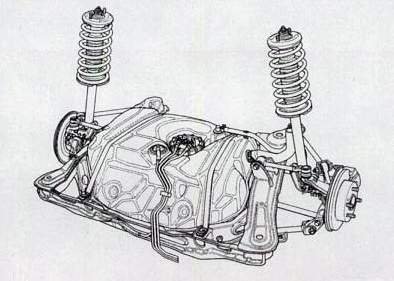 The chassis' basic design is shared with the American and Japanese Accords in that front "double wishbone" and rear, Watts five-link suspension is employed, optimally tuned for European driving and road conditions. Actual design and development work was carried out at Honda R&D's Tochigi, Japan center. Hisao Suzuki, respected development engineer in his own right, producing such dynamically superior vehicles as the Acura NSX and CL (the latter during his American tenure), and his team of development engineers contributed by subjecting prototype cars to the rigors of European driving conditions; ultra-fast runs on Autobahnen, spirited driving on twisty English country roads, and bumpy and treacherous Portuguese surfaces being a few examples of their exercises. Instrument panel is made of 100% recyclable plastics. The European Accord is offered with five engine choices, all inline four types. The base, single overhead camshaft, 1.6-L unit is straight from the Civic line, rated at 85 kW (114 hp) at 6400 rpm and 140 N·m (103 lb·ft) at 5100 rpm, which is also produced at Honda's Swindon, U.K. Plant. This engine is available with a five-speed gearbox. Next is the mainstream engine, SOHC VTEC, 1.8-L unit, producing 100 kW (134 hp) at 6000 rpm and 175 N·m (129 lb·ft) at 4800 rpm, offered either with a manual five-speed or four-speed automatic with sequential manual shift facility. For the upscale LS and ES, a 2.0-L version of the SOHC VTEC engine -- 108 kW (145 hp) at 6000 rpm and 184 N·m (136 lb·ft) at 4800 rpm, again with the four-speed manual or Sports Shift automatic. Unique to the Euro Accord is the Type R, a high-performance model in the tradition of the NSX, Integra, and Civic Type Rs. 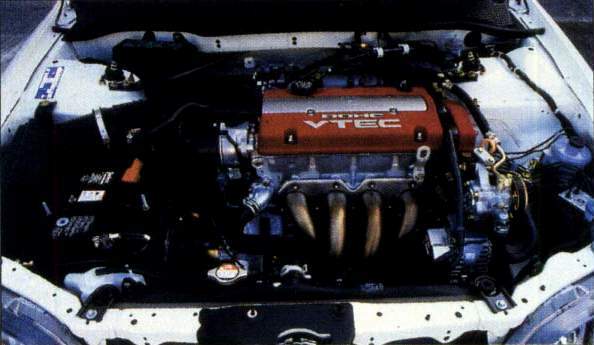 The dual overhead camshaft VTEC, 2.2-L engine is a straight transplant from the Prelude coupe, further tweaked to produce 156 kW (209 hp) at 7200 rpm and 215 N·m (159 lb·ft) at 6700 rpm. This engine's cylinder block is made of a high-pressure casting in aluminum, and employs a fiber reinforced metal (FRM) cylinder liner, a metal matrix composite incorporating carbon fiber and aluminum oxide. The Type R is available with a strengthened five-speed manual transmission only, and is fitted with ultra low profile 215/45R17 tires. The car is capable of reaching a top speed of 228 km/h (142 mi/h), and accelerating from 0 to 100 km/h (0 to 62 mi/h) in 7.2 s.
are built on the same assembly lines at Swindon. All gasoline engines in the new Accord range meet the proposed EU2000 and German D4 exhaust emission standards. Further, the 2.0-L and Type R 2.2-L satisfy the full EU2000 including OBD-II requirement proposed for the year 2000 and beyond. The 2.0-L uses several new technologies first adopted in the California ULEV Accord, including air assist injectors (also used in the 1.8-L and 2.2-L), 4 into 1, double skinned, heat retaining tubular exhaust manifold and a tri-metal 600 cell catalytic converter. Honda continues to rely on Rover for a diesel alternative, a turbocharged, electronically controlled, fuel-injected, SOHC 2.0-L unit rated at 77 kW (103 hp) at 4200 rpm and 210 N·m (155 lb·ft) at 2000 rpm. Two material features unique to the Euro Accord are a plastic fuel tank and a 100% recyclable instrument panel. 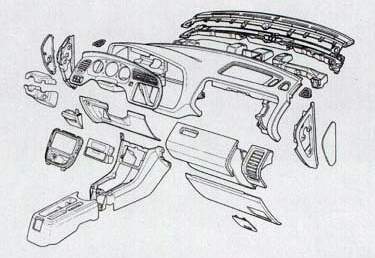 Typically, instrument panels are made by superimposing a PVC skin and polypropylene foam over an ABS base. The mix of materials with different properties is difficult to separate. The Euro Accord panel is made entirely of thermoplastic olefin (polypropylene) compounds, achieved by Honda's new technology in component shaping and adhesive bonding. The Euro Accord is the first and only Honda to feature front-seat SRS side airbags on certain models. A senior Honda engineer confides that proper child seating is adequately regulated and practiced in Europe, whereas in such countries as Japan, in which such disciplines are less rigidly observed, children are often seated in the front, often out of position.